You will not find a more precious collection of newborn accessories anywhere. Each piece is uniquely designed to capture the memory of a lifetime on the day you leave the hospital, at Grandma and Grandpa's first visit, or for your newborn photography session. Our custom newborn designs are handmade to be flexible, soft, stylish, and comfy. We design using luxurious silks, European net, and French lace, and embellish with hand-beaded Swarovski crystal and handmade flowers. Photos by Antonietta Henry Photography. 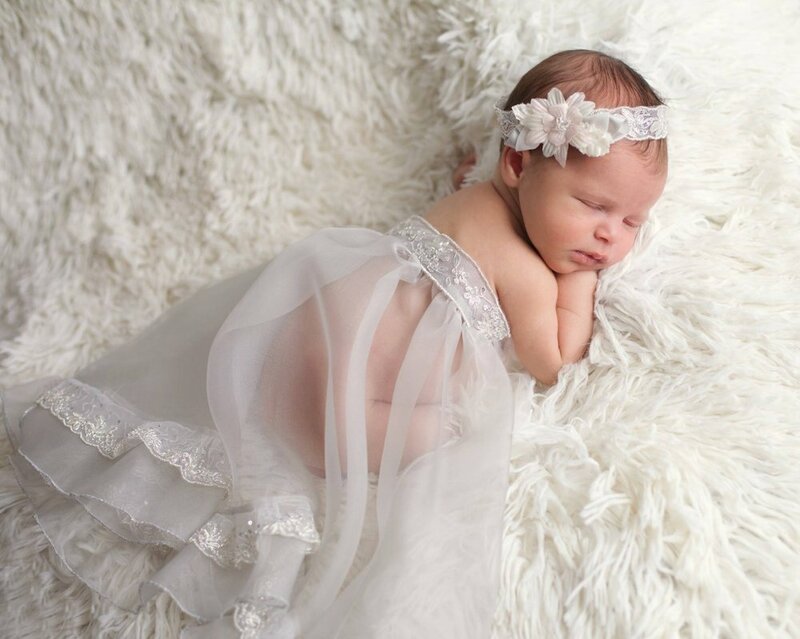 Headpiece.com offers the most beautiful collection of christening gowns and baby boy rompers. The quality is unmatched and the workmanship includes hand smocking, french seams, and hand topstitching. Our custom infant shoes are among our most requested baby items for baby boys and girls. Custom monogramming, lacework and hand-beading make them one-of-a-kind heirlooms to be passed down for generations. While we do sell our gowns and rompers from our store location, allow at least four weeks for production of non stock sizes and custom shoes.